The Art of Naming: Could These 1890s Names Ever Be Revived Again For Modern Girls? Could These 1890s Names Ever Be Revived Again For Modern Girls? We previously took a look at female names that were well-used throughout the 1880s. Today, we'll move forward through time to the next decade and examine 10 names that were hot for girls in the 1890s. More specifically, we want to find names that ranked within the Top 200 back then, but also do not rank within the Top 1000 of 2014. So these names ranked then and do not rank now. What we want to consider is which of these may or may not have the chance to make a comeback for modern girls. 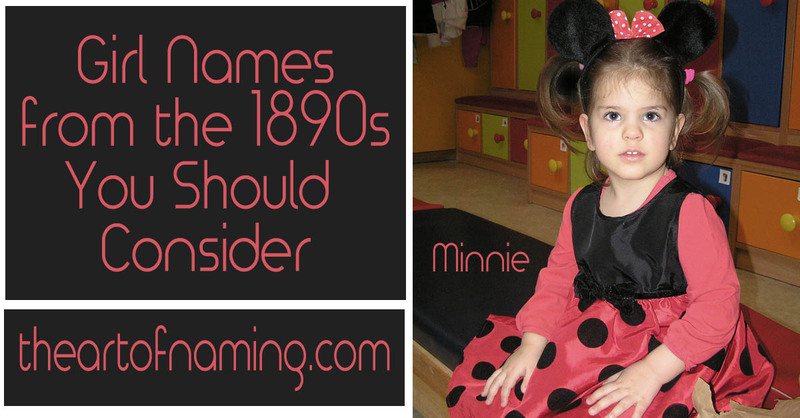 Minnie is one of many nickname names that were fashionable around the turn of the century. Typically it is short for Wilhelmina, which comes from the German Willahelm meaning "will, desire" and "helmet, protection. It could also be short for Minerva which is listed as Minnie Mouse's full name. Minerva is from the Latin mens meaning "intellect" and she is the Roman goddess of wisdom and war. 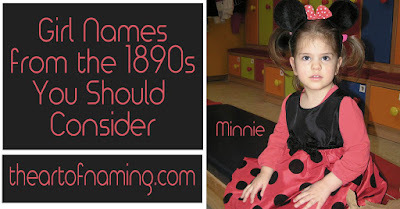 As a name Minnie was popular from the 1880s-1900s, dipped a bit, then peaked between 1915-1920. It fell out of the Top 1000 in 1972. only 48 girls were named Minnie in 2014. Edna is an Anglicized form of the Gaelic name Eithne which means "kernel". It could also be considered a biblical name meaning "pleasure" in Hebrew. This name was most popular from 1915-1925. By the 1990s it was no long ranking in the Top 1000 and now only 88 girls were named Edna in 2014. Could this name ever come back into style? This unusual name is actually biblical. It means "married" in Hebrew and was used in the Old Testament to refer to the land of Israel. As a name, it's been used in England since before the Protestant Reformation. Here in the states, it's only really been used before and around 1920. It hasn't ranked in the Top 1000 since 1959. Usage has been in or around single digits per year including only 11 female births in 2014. Is there any hope left for a Beulah revival? Della is a diminutive of either Adela or Adelaide. Both of those names are said to mean "noble". This is another nickname type of name that were common during this time period. This name was most popular between the 1880s and the early 1960s. It fell out of the Top 1000 as of 1978. Since the 2010s, this name has started to tick upward again, nearing 200 births in a year in 2014. Could you see Della being used again today? Theresa is possibly derived from the Greek theros meaning "summer" or the Greek therizo meaning "to harvest" or it could come from the name of the Greek island of Therasia. Clearly, the meaning is uncertain. This is the English, German and Scandinavian form whereas Teresa is the Spanish and Portuguese form. While Theresa ranked in the 1890s, it did better in the late 1920s and it peaked in 1961. Since it's been popular recently, it is unlikely to be revived for modern girls for another 40 years or so. But it also feels like it should be a classic name that is always used. It fell off the Top 1000 in 2011. Only 223 girls received the name in 2014. Bernice is actually a biblical name, although it is only mentioned briefly as belonging to a sister of King Herod Agrippa II. It comes from the name Berenice which is the Latinized from the Macedonian Berenike which comes from the Greek Pherenike which means "bringing victory". It was commonly used by the Ptolemy family of Egypt. Berenice is related to the name Veronica as well. Bernice was used in the 1890s but it had its only popularity peak around 1921. It left the Top 1000 in the early 1980s, and only received 65 births in 2014. This name is a prime candidate for revival but will it? Loretta either comes from Lora, Lauretta, or Loreto. 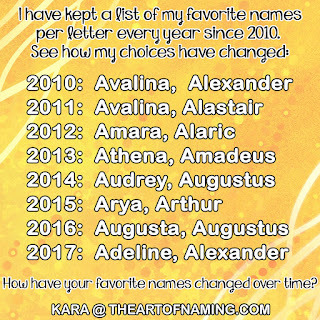 If it is a form of the first two names, they both come from Laura which comes from the Late Latin name Laurus meaning "laurel". Loreto comes from the name of a town in Italy originally called Lauretana. So the exact origin and meaning isn't clear. It started rising in popularity in the 1890s, did well through the 1920s, peaked in 1938 and again in 1955. After that, it went down. By 1991 it was out of the Top 1000. Only 177 girls were named Loretta in 2014. Lulu is nicknamey. It could be short for nearly any name starting with Lu-. If its short for Louise/Louisa, that comes from Ludovicus which is the Latinized form of Ludwig which comes from the German Chlodovech. It's composed of hlud meaning "famous" and wig meaning "war, battle." Or much more simply, Lulu is also an Arabic name meaning "pearl". Finally we have a name that was most popular before the 1900s. It peaked in 1886 with 376 female births, declined a bit, then went back up to 198 births in 1916. Since then Lulu has only becoming increasingly rarer until lately. Around the mid 2000s, usage slightly increased again, but the most births per year was only 58 in 2013, and 51 as of 2014. People may love it as a nickname for a more formal first name, but even Louise doesn't rank in the Top 1000 and Louisa barely made the list recently at #973. Are there not many Lu- fans? Could any of these gain more usage in the coming years? While Marian is sometimes considered a combination of Mary and Ann, and it may well be, it is also a variant of Marion which comes from Marie, Maria, Mary. Ultimately, it comes from the Greek Μαρια from the Hebrew Miryam meaning either "sea of bitterness" or "rebelliousness" or "wished for child". This spelling of Marian seems to be considered the feminine spelling while Marion has always had decent usage for boys and girls alike. For girls, Marian and Marion have had very comparable usage but Marion was slightly more popular. However, Marian had two good peaks, one in the early 1920s and one solo run in 1954. After that, she's declined, leaving the Top 1000 in 1992 and only receiving 189 female births in 2014. Selma's true meaning and origin remains mostly unknown. However, it is possibly a short form of the name Anselma which is the feminine of Anselm. Anselm is a German name derived from the elements ans meaning "god" and helm meaning "helmet, protection". Selma ranked well through the 1890s but did even better through the teens up until the 1930s. By 1957, Selma fell off the Top 1000 chart. It has remained rare since then with only 108 female births in 2014. Could Selma gain more popularity in the coming years? We're approaching her 100-year mark since she was most popular in 1918 with 798 births. Time for a comeback?